Finding customers online is hard. 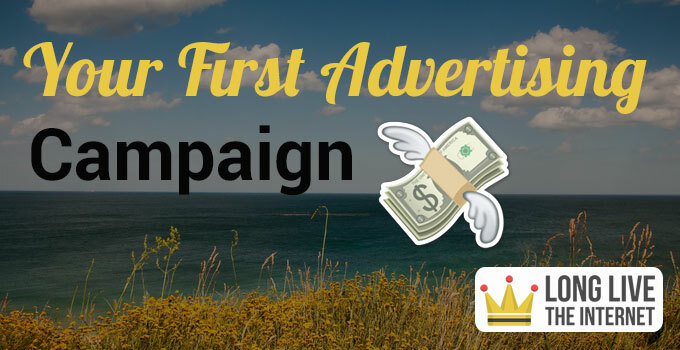 Setting up your first ecommerce advertising campaign is hard. There is no doubt about it. 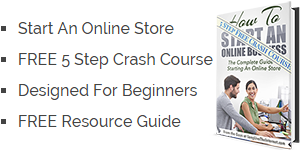 If you are running your own online store or business you know it first hand. It takes experience in launching a product or store online and hearing crickets for the first few days to really know how difficult finding customers online can be. If your launch experience was different, please share your story with me. I have a great deal of admiration for you and even more to learn from you. My wife has done a great job of getting sales for her online children’s clothing store from friends, family and her extended network using a mix of offline marketing and hustle. She has worked her tail off and within a short period of time was able to extend her offerings and grow her inventory. At this point in time we are looking to extend her reach into new channels. In the remainder of the post I am going to share how we structured our first ecommerce advertising campaign. When my wife’s inventory reached a reasonable size it was time to start thinking about opening new sales channels. I made a mistake when she first launched of setting up a simple Google Adwords campaign. We were getting clicks and traffic from the campaign, but no sales. At the time my wife did not have any depth in her inventory. For example, she would have only two sizes of a popular clothing item. Someone would click on our Google ad and then not find the size they were looking for. We also did not have a budget allocated to the campaign, so after spending a few hundred bucks with no conversions we turned it off. I am not counting this experiment as our first ecommerce advertisting campaign as it had no structure and was poorly thought out. When first starting out every penny matters. In hindsight, we probably should have waited to start a Google pay per click campaign. We would have been better served by saving every cent to re-invest into inventory. You live and you learn. If you are just starting out and are starting out as a retailer, I recommend holding off on pay per click advertising unless you have depth in your inventory. If you are only selling one product, I would recommend starting a campaign right away. Along with the initial Google Pay per click campaign, I also ran a simple Facebook campaign. This campaign was also destined for the same fate as my poorly thought out Google campaign. Even worse in the case of the Facebook campaign, I was running it as if it were a Google Pay Per Click campaign. Facebook advertising is very different from Google advertising. You may read that statement and say, “obviously.” Again, lessons learned. Yes, obviously Google and Facebook are very different platforms. Keep that in mind when you are thinking about running an advertising campaign. Think about how you use each of the platforms. When you are using Google you are typically searching for something. I know, it sounds obvious. When creating a pay per click campaign you are advertising to users who are searching for your product or a product similar to yours. 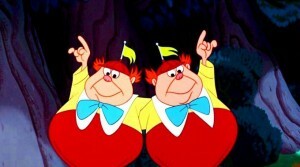 These folks are said to have “purchasing intent.” They are most likely searching for a product to buy it. Now, think about how you use Facebook on a day to day basis. What is your behavior like on that platform. If you are anything like me or any other of the billion Facebook users, you are probably using the platform to consume content. Browsing what your friends are up to or reading stories that your friends have shared, you are consuming and creating content. When advertising on Facebook you should cater to the natural tendency of users on the platform. Facebook users want to consume content, when advertising to them, give them content. Users browsing their Facebook feed do not have the same purchase intent that someone searching for something on Google will have. Each platform has their own pros and cons. As long as you design your advertising campaign to appropriately target their users, your campaign should be successful. Not all advertising campaigns are equal. When thinking about trading money for visibility it is in your best interest to think about the reason you are doing it and what you want to accomplish. In my wife’s case, we wanted to bring in new potential customers. To further clarify what I mean by “new potential customers.” I mean email addresses. With an email address we will have multiple chances to reach a potential customer and if we have a product they are interested in, maybe they will buy it from us. While we work on improving our messaging and marketing, email gives us more flexibility than the all or nothing scenario of our previous marketing attempts. We decided to focus on building our Facebook advertising expertise. Facebook makes sense for my wife’s brand. In addition to being able to leverage her existing personal reach on Facebook, she has grown her brand page reach organically and it is the platform she currently knows best. Your familiarity with a platform should be a deciding factor when you are creating your first ecommerce advertising campaign. If you are not a big Pinterest user, it is probably not a good idea to setup a new Pinterest advertising campaign. Get to know the platform first. Then try a smaller campaign once you are familiar with the platform. We want to bring in some new customers through advertising. What is the best way to do it? I don’t think there is a right or wrong answer. When mapping out any campaign you want to setup some parameters or objectives. If we do not have goals, how can we judge the effectiveness of our campaign? We can’t! First, you need to analyze your business and figure out how much you are willing to spend to acquire a new customer. In a new business it’s difficult to determine your exact cost of customer acquisition. Customer acquisition costs are calculated by dividing the total costs associated with acquisition by total NEW customers, within a specific time period ( Total Costs / total NEW customers). To be clear, this metric should only account for new users that were brought in through a specific campaign. You cannot count existing customers that end up purchasing again. Even if they purchased because of the campaign. If you are like me, you might be wondering, how do I calculate my cost of acquisition if I have never run a campaign. Or even worse, if you have run a campaign but it did not lead to any sales? You don’t! We can all agree that CAC is an important metric, however, at this point in your business you simply do not have enough data to calculate an accurate number. Let’s come up with another metric that can be useful in crafting our first campaign. As the starting point for our campaign we used average order size. This metric worked well for us for a few reasons. First, it is easy to calculate. Even if you only have a few orders, you can take the average of each order and come up with an average order price. Second, average order size gives us a number we can target when we are creating our campaign. For example, let’s assume that your average order size is $50. Using an average order of $50 we can set up our campaign in a manner that we do our best to maximize our return on investment, ROI for short. The average order size will form the basis for all of the other calculations we are going to make. If you are using Shopify, you can quickly calculate your average order size. Login to your admin. Click on the Orders tab and then click on export near the top right of the screen. 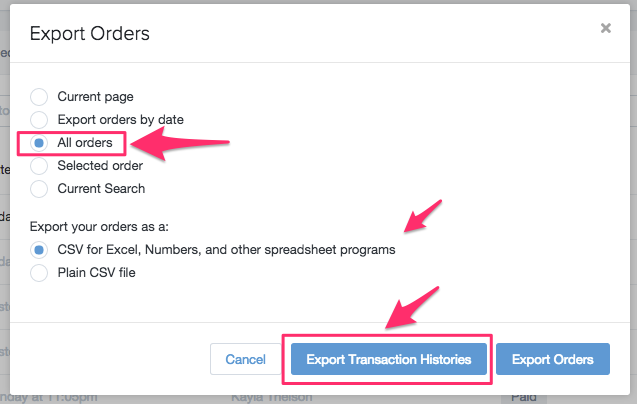 Once the export orders modal is open, select All Orders, CSV for Excel and then click the button that says Export Transaction Histories. Shopify will then email you the orders. If you do not have Microsoft Excel or Numbers installed on your computer you can always upload the CSV file to google docs. Once you have the document open you want to select all of the numbers in the amount column. In your spreadsheet program of choice, you should see a drop down menu near the bottom right that will either have sum or average as the default. If the field currently reads sum, go ahead and toggle it to average. That is your average order price. If you do not have any easy way to get your order information into CSV or if you do not have a spreadsheet program don’t fret. You can perform these calculations manually. Add up all of your orders. Then divide the sum of all of your orders by the number of orders. So, if you have two orders, the first for $75 and the second for $25, your average order size is $50 (100 / 2). Great, we have calculated your average order size. What are we going to do with it? Personally, I used the average order size to make estimates about my campaign and how much I was willing to spend on it. By establishing the average order size I have an estimate of how much a new customer will spend on an order. For example, would I be willing to spend $500 to bring in 50 leads (customer emails). Well, it depends right? Let’s say of those 50 leads that I paid $500 to acquire, I am able to get half of them to buy something from me. In our simple example, we have an average order size of $50. 25 orders of $50 is $1250 in gross product sales. From this point you have to take into consideration margins and profit to see if this campaign is attractive to you. Keep in mind the conversion rate I used from turning a lead into a customer is astronomically high. It is better to use a more conservative number when you are coming up with your campaign budget. In a more realistic case, let say we are able to convert 20% of our leads into customers. 20% of 50 is 10. Using our average order size of $50 we are now estimating $500 in sales (10 x $50). Does this make sense so far? You just spent $500 to bring in 50 leads. Of those 50 leads, you got 10 of them to purchase totaling $500 in sales. You spent $500 to make $500 not terrible, but not great if you have a margin on your product. If you are a retailer, selling other people’s products, you are purchasing at wholesale prices and reselling at a higher price. The amount difference between your purchase price and the price you are selling the product for is your margin. In the previous example, if your average margin was 50%, you are netting $250 from your $500 in sales (50% of $500 = $250). This is not good as you are actually losing $250 running this campaign. Sure, the customer might re-order later and you might recoup your advertising costs on future purchases. But what if they don’t. Better to create a campaign that tries to guarantee profitability. More important than the actual numbers is the process of setting up estimates and goals. The biggest mistake I made when running the initial campaigns for my wife was running them without any estimates or goals in mind. I was taking shots in the dark and hoping that my advertising guesses would work out in the long run. Bad idea. If you are just starting out you might not have any numbers to use as estimates. It is still good practice to get into the routine of making estimates. If you know the cost of your products you can start making an estimate of your average order. Do not worry too much if it is inexact as you are making educated guesses. When dreaming up your campaign it is important to create the financial projections. Do not go into a campaign without knowing how much you are willing to spend. I would also recommend breaking out a few more goals and estimates for your campaign. For example, the cost you are willing to pay per lead. Also how many of those leads you would like to convert into customers. Here is what we have so far. Finding customers online is hard. When creating an advertising campaign we need to make sure that we are aligning intents. Your Google Pay Per Click campaign should differ from your Facebook campaign. When creating a campaign you need to have financial estimates. Even if you are not sure of your average order size you need to estimate one. Then from there you can set a budget of how much you are willing to pay to acquire a new lead. Then keep an estimate of how many of those leads you are going to turn into customers.